They came out of now where, the lead singer from the war-torn streets of Palestine..settled in Toronto, Canada,called themselves Magic!. Created a fusion between Reggae-Pop-rock..called the song "Rude", which the Times Magazine called the worst song of 2014 but OWNED the no.1 spot in the Billboard Hot 100 charts for six consecutive weeks, selling more than 8.6 million copies around the world.. with 1.2 billion legit YouTube views to-date. Initially released on the 11th of October 2013 from their album Don't Kill The Magic, the song is based on a real life fight between the lead singer Nasri and his blonde girl friend which had a heavy impact on Nasri's profession as a musician as well as his band members. The reality was..that Nasri broke up with his girl friend but the music video shows a happy ending..keeping in mind, the band's future, the song's commercial success as well as the endorsements. But still this is no sugar coated boy band stuff and deals with the harsh reality of interracial dating.The boy friend played by Nasri is of Asian origin..while his girl friend is white. The girl's father objects to his daughter's desire of wanting to marry an Asian man and expeditely arranges for a groom of his choice without his daughter's consent. 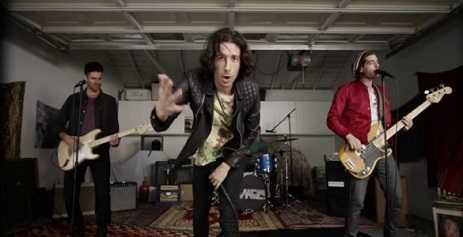 In the beginning of the music video Nasri is seen having fun with his girl friend and singing the song while his band members play guitar and drums at the background. He goes back to his band members who console him while his girl friend and the future groom get ready for a special dinner..the father raises the toast everybody expect the girl raise their glasses.. Nasri who sings with his band members to chase the blues away, suddenly gets a call on his mobile from his GF and he rushes to his house and bangs her front door. The girl and her father get into a heated arguement, she changes her clothes rushes to the front door hiding a ring inside her hands..Nasri who is waiting outside, gets down to one knee and officially pops the question .."will you marry me? ".She says yes and he inserts the ring around her fingers. The girl's mother played by actress Mary Kay McCartney..brings the father out to bless his daughter, as Nasri once again sings "Can I have your daughter for the rest of my life..say yes..say yes..?" but the father shows his back and quietly shuts the door.While the newly we couples enjoy the party with the band members. The Magic! band members Nasri – lead vocals,Alex Tanas – Drums, vocals,Mark Pellizzer – guitar and Ben Spivak – Bass went from nobodys to superstars in a span of two months since the re-released version of "Rude" in February 2014. From a bunch of unrecognizable faces to prime time interviews, thronging female fans at the airports & concerts and millions of dollars in royalty payments..life has indeed come a full cirle for Magic! the band.